We’ve seen a number of publishers in the coupons/vouchers space use the “event” markup to describe their offers. And as much as using a discount voucher can be a very special thing, that doesn’t make coupons or vouchers events or “saleEvents”. Using Event markup to describe something that is not an event creates a bad user experience, by triggering a rich result for something that will happen at a particular time, despite no actual event being present. While we’re specifically highlighting coupons and vouchers in this blogpost, this applies to all other non-event items being annotated with “event” markup as well -- or, really, for applying a type of markup to something other than the type of thing it is meant to describe. For more information, please visit our developer documentation or stop by our Webmaster Forum in case you have additional questions! Lately we’ve been receiving feedback from users seeing non-events like coupons or vouchers showing up in search results where “events” snippets appear. This is really confusing for users and also against our guidelines, where we have added additional clarification. of close parity between AMP and canonical page, for pages that wish to be shown in Google Search as AMPs. Where we find that an AMP page doesn't contain the same critical content as its non-AMP equivalent, we will direct our users to the non-AMP page. This does not affect Search ranking. However, these pages will not be considered for Search features that require AMP, such as the Top Stories carousel with AMP. Additionally, we will notify the webmaster via Search console as a manual action message and give the publisher the opportunity to fix the issue before its AMP page can be served again. The AMP open source website has several helpful guides to help produce fast, beautiful and high-performing AMP pages. We hope this change encourages webmasters to maintain content parity between the canonical and AMP equivalent. This will lead to better experience on your site and ultimately happier users. To improve our users' experience with AMP results, we are making changes to how we enforce our policy on content parity with AMP. Starting Feb 1, 2018, the policy requires that the AMP page content be comparable to the (original) canonical page content. AMP is not a ranking signal and there is no change in terms of the ranking policy with respect to AMP. The open source accelerated mobile pages project (AMP) launched in 2015 and has seen tremendous growth with over 25M domains having implemented the AMP format. This rapid progress comes with a sense of responsibility of ensuring that our users continue to have a great content consumption experience that ultimately leads to more engagement with publisher content. In some cases, webmasters publish two versions of their content: a canonical page that is not based on AMP and an AMP page. In the ideal scenario, both these pages have equivalent content leading the user to get the same content but with a faster and smoother experience via AMP. However, in some cases the content on the AMP page does not match the content on its original (canonical) page. In a small number of cases, AMP pages are used as teaser pages which create a particularly bad user experience since they only contain minimal content. In these instances, users have to click twice to get to the real content. 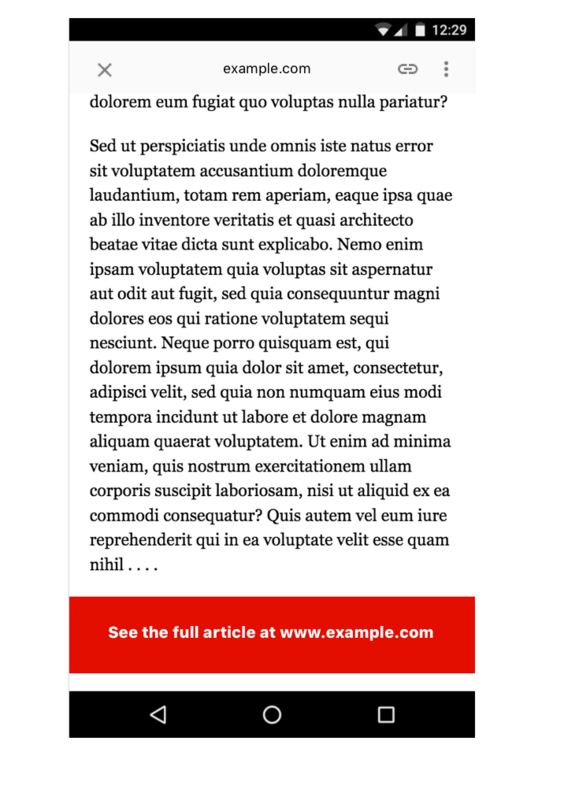 Below is an example of how this may look like: a brief text of the main article and then asking the user to click to visit another page to complete reading the article. AMP was introduced to dramatically improve the performance of the web and deliver a fast, consistent content consumption experience. In keeping with this goal, we'll be enforcing the requirement of close parity between AMP and canonical page, for pages that wish to be shown in Google Search as AMPs. that put the convenience of Search into the hands of job seekers. 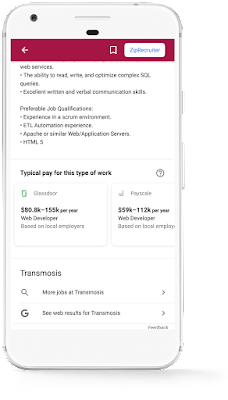 Today, we are taking the next step in improving the job search experience on Google by adding a feature that shows estimated salary information from the web alongside job postings, as well as adding new UI features for users. We've heard from users that having accurate, street-level location information helps them to focus on opportunities that work best for them. 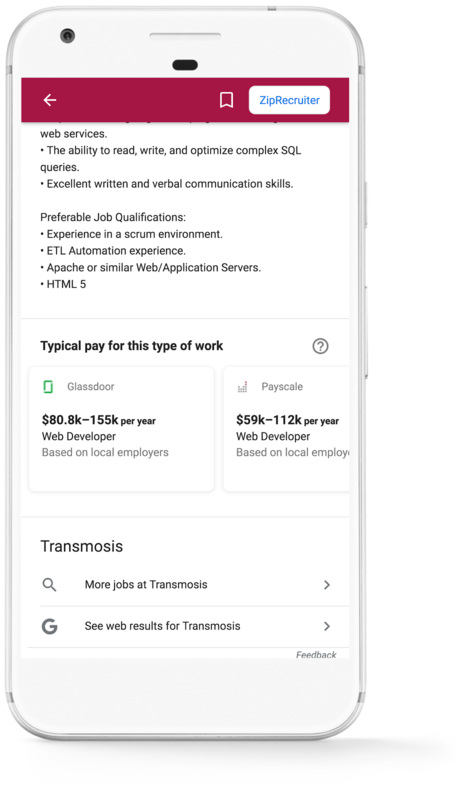 Sites that publish job listings can do this can do this by using the jobLocation property in JobPosting structured data. 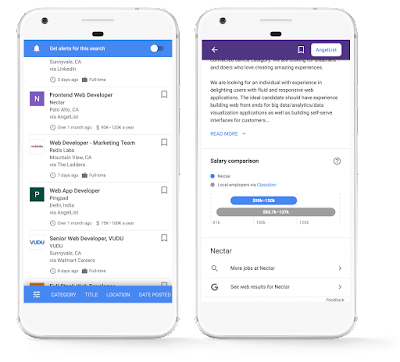 To double-check the structured data on your pages, we'll be updating the Structured Data Testing Tool and the Search Console reports in the near future. In the meantime, you can monitor the performance of your job postings in Search Analytics. Stay tuned!